Trivecta 🔜 Arizona: "RT @funky__monkey_: It’s a @woolimusic, @TrivectaMusic, @iamdabinlee, @SaidTheSky, @SlanderOfficial, @Tritonal, @JasonRossOfc, @ILLENIUMMUS…"
Trivecta 🔜 Arizona: "@saybluemusic @ChimeTunes Help us get it there 👊 see ya onboard"
Trivecta 🔜 Arizona: "@DaveRishty Feel that re: personal brand"
Sam Dobkin, better known as Trivecta, is a dance music producer and songwriter from Tampa, FL. He’s stylistically known for creating melodic trance, dubstep, bass, and drumstep music. Since his first release with Monstercat in 2014, Trivecta continues to make waves in the trance, dubstep, and drumstep worlds. 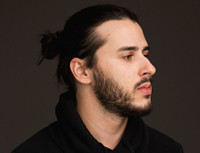 His ability to incorporate melodic elements with production that sometimes includes a progressive house and bass feel attracts would-be listeners across the dance music scene. Often working with other songwriters, producers, and vocalists, Trivecta stays true to his collaborative spirit as he continuously explores new ways to create music with other talent. 2017 was a breakout year for Trivecta, hopping on tours with Illenium, Seven Lions, Tritonal, and Kill The Noise, as well as getting support from the likes of Don Diablo, The Chainsmokers, Arty, Gareth Emery, and Tom Swoon to name a few.